Our goal is to instill passion, confidence and comradeship amongst the badminton enthusiasts of Pacific Northwest. Session 3 class is now open for registration. Please call our front desk to sign up. Limited Seats, Hurry Up! Members have Personal Development Goals (PDGs) and coaches can support players to identify 3 or 4 key PDGs. Our private lessons get one-on-one attention and helps to acquire skills at a much faster rate. Hosts weekly league ladders and tournaments throughout the year. Team of professional coaches that can support any levels of players. After evaluating your style of play, we will suggest you the best coach suited for you. Host any corporate event/team bonding badminton matches with different companies or group of players. Club sponsorship for talented promising upcoming players. Members have 24/7 access to 13 badminton courts. Li-Ning authorized dealer, One stop Badminton Pro Shop, Quick Restring Service, Racket / Shoe Rentals are available. Members have access to Ping Pong(Table Tennis)table, Pool table, Foosball & Xbox. 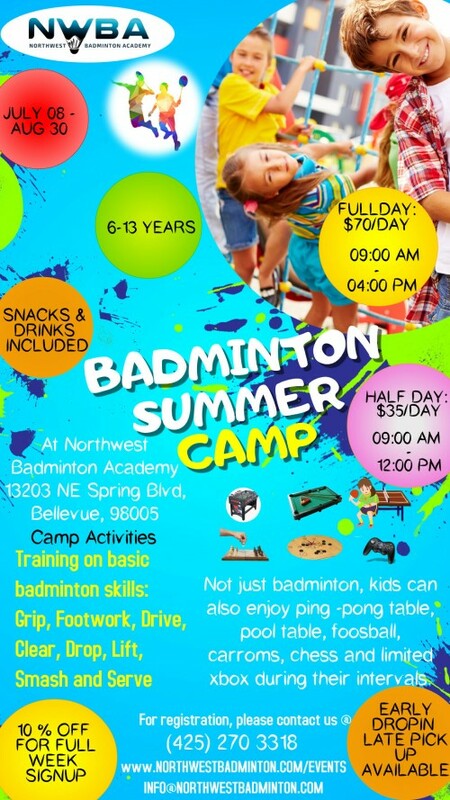 Copyright © Northwest Badminton Academy 2018. All rights reserved.